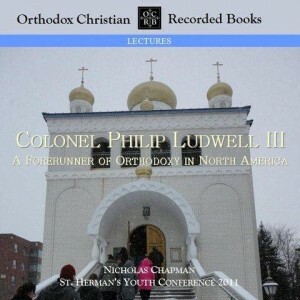 Click the image to order a copy of Nicholas Chapman's lecture on Philip Ludwell III. Recent research has brought to light the existence of an Orthodox presence in colonial Virginia more than half a century before the arrival of the Russian Orthodox missionaries in Alaska. The Virginian believers were centered on Colonel Philip Ludwell III, who was the largest landowner in British Virginia. How did he come to the Faith and what did he do to bring others to the Church? Why is his story important for us today, and what can we learn from it to inspire our own love for God and desire to serve Him? Nicholas Chapman addresses these questions and others in this presentation, using materials from his upcoming book on the subject. To order the MP3 for $4.95, CLICK HERE. To order the boxed CD (with the Ludwell portrait and book plate) for $9.95, CLICK HERE.